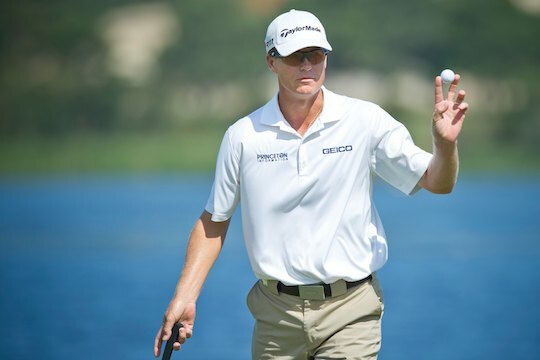 John Senden is a PGA Tour winner once again. However, there was a time when even he didn’t know if that sentence would ever be written, such was his inability to close. How the 42 year-old added the 2014 Valspar Championship to his 2006 John Deere Classic triumph is a tale told many times. However, it is also very distinctive to the veteran Australian who hass endured every emotion over those seven and a half years. When it comes to consistency few are better than Senden who has amassed over US$12 million between PGA Tour wins. While money is important for longevity, all players know their careers are judged by victories and the big Queenslander knew he was better than that. Speak to those who know him best and they’ll tell you he’s one of nature’s gentlemen. Typical of those who come from the country, the Senden’s along with wife Jackie and son Jacob are good honest, genuine people – the world needs more of them. But when it came to winning that gentle nature worked against him, he lacked what Jack Newton calls “mongrel”. It’s the ability to tough out wins when the pressure comes on. His long time coach Ian Triggs, who also mentors Karrie Webb, once told me “if Sendo had half of the mongrel Karrie’s got, he’d have won many more times.” It’s something you can’t coach, you’re either born with it or you’re not. For that past four years I have had the privilege of covering John’s journey more closely both in Australia and on the PGA Tour. It’s a saying he got from Ian Baker-Finch, who assists Senden with his putting. It’s the part of his game, which has improved immensely over that time, yet he still gets very little credit for it because his ball striking is so pure. Senden’s flaw was his inability to putt well when it mattered, so “let it go” became his motto. He had to let go of the fear of missing and let go of the putter as in ‘release it through the line’, too often he would steer his putts down the stretch, which cost him dearly. Frustrated by the lack of results this year, he rang his ‘putting guru’ two weeks ago. It was a timely call. “We spent Monday at The Honda playing golf and just talking about the mental side of winning, the conversations continued over dinner that night. Then on Tuesday we worked long and hard on the putting green,” said Baker-Finch. It led to a 63 on Day 2 at the difficult PGA National. It was a positive sign he was heading in the right direction. But what were the magic words that led to the win in Tampa Bay? Well the “gravy” just got a little tastier. A month off turning 43, Senden is exempt on the PGA Tour for a further two years plus he’s headed back to The Masters next month. He’s back in the inner sanctum of golf. Baker-Finch believes Senden can become a “consistent winner” even in his 40’s. Let’s hope Sendo keeps “letting it go”.